HTC revealed its latest Android 4.0 ICS power Smartphone at MWC 2012. 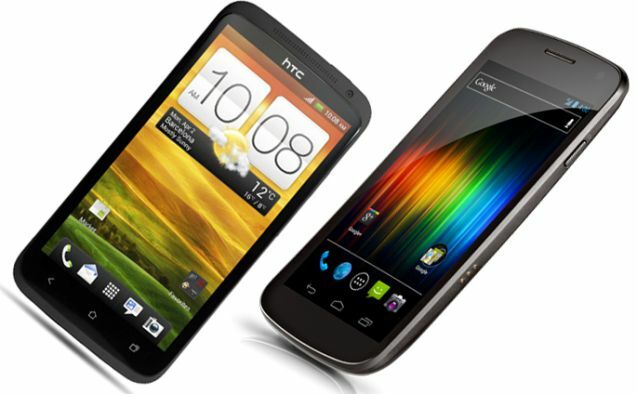 Many of you planning to buy Android 4.0 ICS phone and still prefer Samsung Galaxy Nexus as a best ICS phone, I suggest you to take a look on HTC One X. I pitch them against each other to see which Smartphone is best. Processor play important role in Smartphones, it decides how fast your phone works. HTC One X is powered by 1.5 GHz NVIDIA Tegra 4 Quad-core processor, 12 GeForce GPU cores whereas Samsung Galaxy Nexus is powered by 1.2 GHz Cortex A9 Dual-Core processor. Quad-Core is quite powerful processor when its compared to Dual-core processor. So One X might turn out to be better performer than Galaxy Nexus. Both One X and Galaxy Nexus carries 1GB of RAM and 32 GB of Internal Storage. Both smartphones lack microSD card slot. But here One X is one step ahead than Galaxy Nexus, as One X offer 25 GB of Cloud storage for 2 years which is very fruitful in today’s world. One X is heavily integrated with Dropbox which you can’t achieve in galaxy Nexus by installing dropbox apps. One X comes with 4.7-inch Super LCD2 touch screen with 720 x 1280 resolution and 312 ppi pixel density. The 2.5D Corning Gorilla Glass has added to protect the display of the phone which is best protection available in the market. Galaxy Nexus comes with 4.65-inch Super AMOLED display with 720 x 1280 resolution and 316 ppi pixel density. The contour Display has added to protect the display of the phone. Both Smartphones are powered by Android latest flavor Android 4.0 Ice Cream Sandwich OS. So both phones has similar potential to its cores. One X comes with HTC Sense 4.0 UI which is incredibly great, while Galaxy Nexus comes with Vanilla UI which simple and elegant but lacks features when we compared to Sense 4.0 UI. If you’re like Sense UI than One X is good otherwise you can enjoy Vanilla UI. One X has 8 MP camera with autofocus and Smart LED Flash capable to record 1080p HD Videos. HTC did some work on its camera, now its comes with ImageSense, the new technology from HTC bring improvements to its camera including lens, sensor, software and its integrated with new custom HTC ImageChip. HTC ImageSense has ability to work with less or no light and automatically adjust its flash based on the lighting. The f/2.0 lens help to capture pictures in low light condition. You can capture both Videos and Photos at the same time. Galaxy Nexus has 5 MP camera with autofocus and LED flash capable to record 1080p HD videos, but unfortunately the camera technology in galaxy Nexus is not smart as One X but you can shoot videos in time lapse mode or capture panorama photos. One more great features is that Galaxy Nexus camera comes with in-built photo editing all you to edit pictures, add filters and effects, adjust color, straighten, reduce red eye, crop, rotate, flip, and even doodle on your favorite photos. The Samsung Galaxy Nexus has no TouchWiz on it. It has stock launcher.